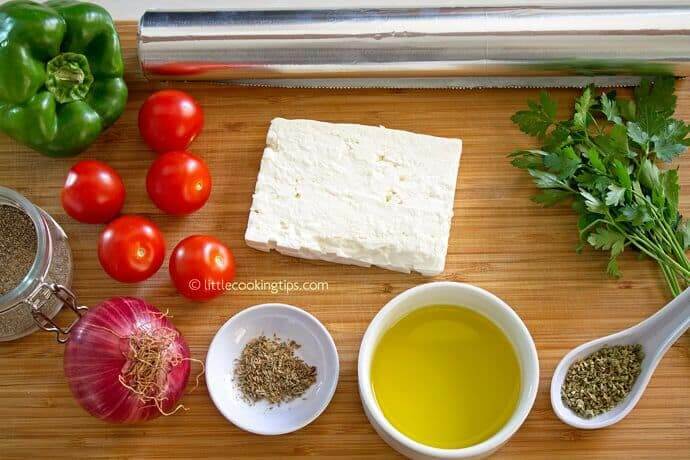 Oven Baked Feta — Greek Style is a quick and easy appetizer made from baked feta cheese topped with red onion, bell pepper, tomato, EVOO, pepper, and herbs. It is great for parties and get-togethers! Hello, y’all! Looking for something quick, easy, and made with simple ingredients to share at a party, BBQ, get-together, or sports game? Oven Baked Feta — Greek Style will delight the most demanding palates without causing you a hassle in the kitchen. Now that’s our type of appetizer! 😉 And you know what? It is brought to you by my favorite Greek friends, Mirella and Panos — true experts in Greek cuisine. They are a Greek couple, living in the gorgeous city of Athens, and co-authors of the delicious food blog, Little Cooking Tips. On their blog they share stories of their life in Greece, a wealth of Greek/Mediterranean recipes, cooking video selections, some product reviews, and stunning images of Greece. It is a must-read blog! Folks, let me tell you, these Greeks can cook — for real!!! 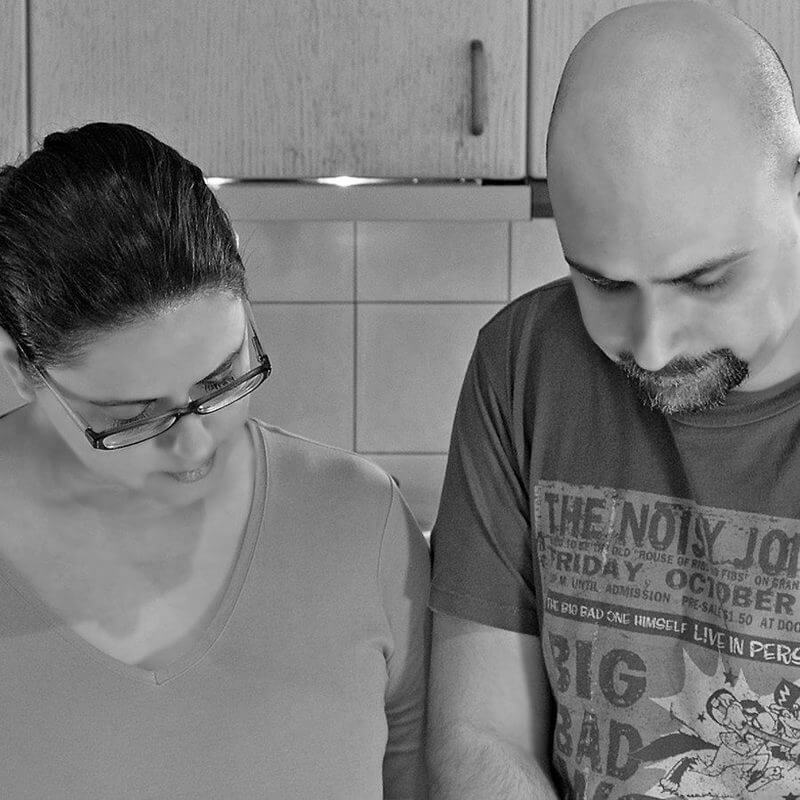 “We are Mirella and Panos, blogging at our little corner of the Internet called Little Cooking Tips. Our recipes are mostly Greek and Mediterranean, cooked with real food in our small home kitchen. We felt so honored when Denise, from Easy and Delish asked us to be part of a guest post series on her blog. 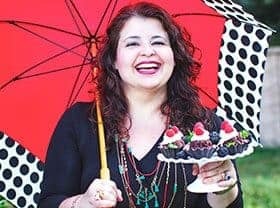 You see, we have been following her for quite a few years now, from the early days of her previous blog From Brazil to You, where she introduced us to her awesome, authentic and delicious Brazilian recipes! Denise has been an inspiration to us throughout the years and taught us so many things about cooking. For that, all her beautiful posts and her constant love and support, we’d like to take this opportunity to say a huge THANK YOU to her, from the bottom of our hearts! Denise’s theme in this guest post series was easy weeknight meals or quick desserts. 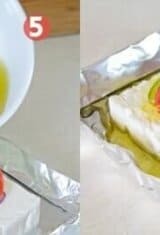 Most Greek foods often take a little time to prepare, so we considered some of the simpler recipes we could use for this post, and after discussing this with Denise, we both agreed on easy and yummy appetizer, which can also be served as a light meal, along with a salad and/or some crusty bread. This dish is the Oven Baked Feta! Some people also call this dish Feta saganaki, even though Cheese saganaki is mostly a fried slice of cheese. You can find oven baked feta at almost every tavern in tourist locations throughout the country, especially in the summer. It’s one of the most popular dishes, and it’s usually one of the dishes people order to accompany grilled meats and tempura-style fried veggies. The ingredients are very easy to find, very simple and the result is really delicious. Since the ingredients are only a few though, we suggest you use the best quality you can purchase. For instance, authentic sheep’s milk feta is highly recommended as well as organic tomatoes and peppers. 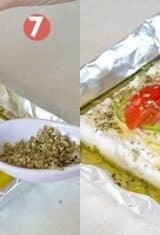 To prepare the dish, you simply make a small “tray” from foil, add feta, onion, tomatoes, pepper, thyme, oregano and EVOO and broil it for a few minutes. The texture of the feta completely changes to slightly crunchy on the outside and soft and yummy on the inside. The veggies and the oregano add a lot of flavor and texture as well. With the quantity described in this recipe, you can serve 2. 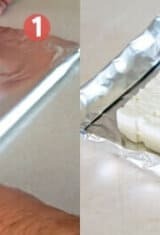 You can easily, however, make a few more trays of foil with the same combo and serve A LOT more people. Take it from them! Prepare this simple and healthy appetizer and delight your crowd at any occasion. I would like to thank Panos and Mirella, for kindly accepting my invitation to guest post. We are so happy to have you here! For now, enjoy this scrumptious Greek dish — and celebrate life… like Greeks do so well! 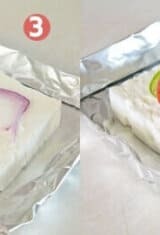 Oven Baked Feta -- Greek Style is a quick and easy appetizer made from baked feta cheese topped with red onion, bell pepper, tomato, EVOO, pepper, and herbs. It is great for parties and a get-together! Preheat the oven broiler (if it has a temperature setting as well, set to 220C/430F). 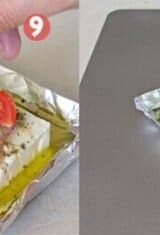 Cut a piece of foil, about four times the area of the feta slice and fold in half (pic.1). 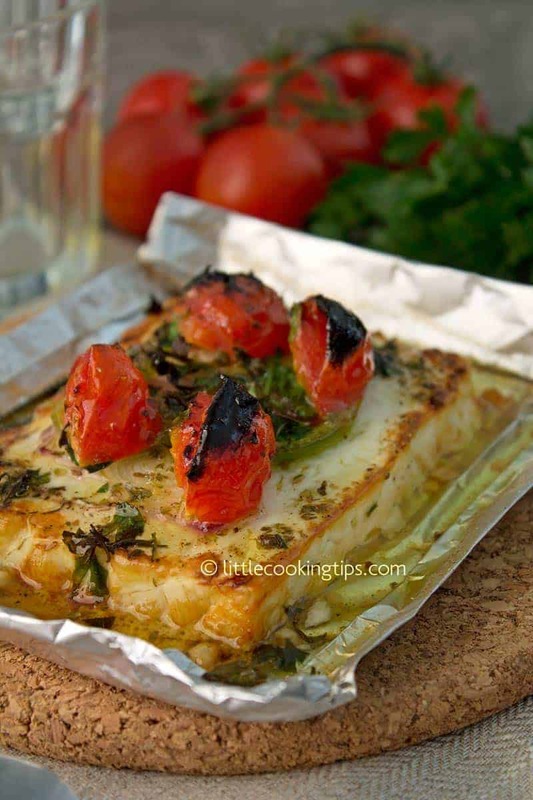 Add the feta slice, fold and lift the 4 sides of the foil, to create a shallow baking “tray” (pic. 2). Add the onion slices (pic. 3). Add the peppers and the tomatoes (pic. 4). Add the olive oil (pic. 5). Add the thyme (pic. 6). Add the oregano (pic. 7). Add the pepper (pic. 8). Add the parsley (pic. 9). Place the tray in a baking dish or cookie sheet (pic 10). Bake at the top oven rack, right under the broiler, for 8-10 minutes. Serve immediately with fresh crusty bread and/or salad and/or grilled meats or fish and/or fried veggies (like zucchini or eggplant slices). Kali oreksi! Tips: 1. You can make countless variations of the dish, adding your favorite herbs or spices . 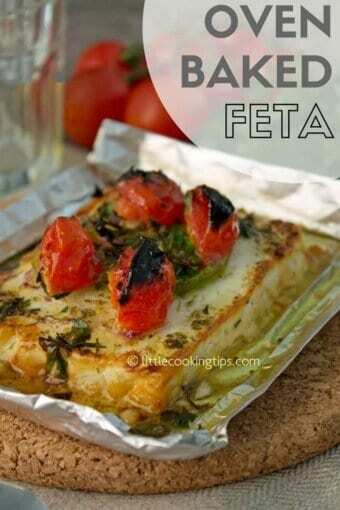 For instance, people also like to bake feta with fresh dill or fennel fronds or paprika. 2. You can easily adapt the quantity of onion, pepper or tomato according to your liking. It was truly such a huge honor to guest post here Denise! So glad that you liked this recipe:) It’s one of our favorites and pretty much a staple in our household. THANK YOU SO MUCH, for the opportunity to share one of our recipes in your amazing blog! It really meant a lot. Thank you both, my wonderful Greek friends, for sharing a piece of your delicious work here. I am thrilled to have you guys here. And yes, I will be making this appetizer soon. Sending our love! Good to meet you, Mirella and Panos! What a wonderful recipe you’ve shared with us — this looks So good. And easy — my favorite kind of cooking. 🙂 Thanks so much. Quick, easy snd flavorful, just what summer is all about! A scrumptious guest post! Lol, we totally get it, Raymund! Thank you! I’m trying this tomorrow – can’t wait! M & P, you rock! This cheese looks so good. It is perfect to share with friends and with a glass of wine! Well said! A Santorini Assyrtiko or Sauvignon Blanc would pair perfectly:) Thank you! Such a great recipe! Simple yet so delicious! We are big fans of feta cheese and this is just the dish I need. Amazing! Quick and delicious! Just what an average man needs to prepare a meal and maybe impress a lady 🙂 Thank you very much for sharing! I went to the Greco-Albanian border yesterday. Tried to make dish with feta. Next thing you know, albanian steels my cheese. Yes! This Recipe is really variation oriented. After applying variation like herbs and spices this item converted to Appetizing dishes. I take credit from my family members. Thanks for sharing this Recipes and tips. Thank you so much for the recipe. I made it as an appetizer for a get-together and everyone loved it.